A new and unique mindreading prediction effect! An aluminum plate is shown to the audience. In the upper portion, there are five numbers corresponding to the bolts fixed on the same plate. In the lower portion, a second plate covers another set of bolts. 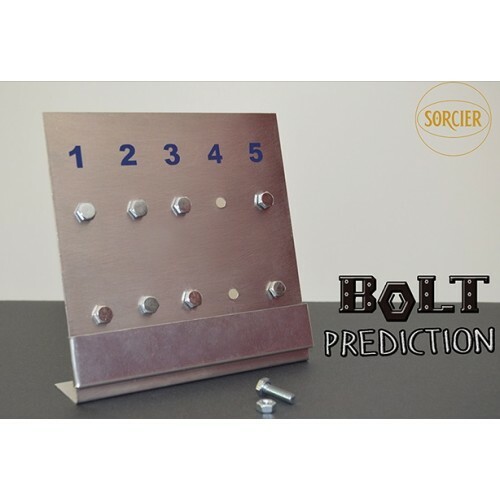 The mentalist states that before this effect began, he had unscrewed a lower bolt - his prediction is covered by this second plate. Now the spectator names any of the five numbers, and the bolt at that number is unscrewed. The second plate is lowered, and it is seen that the bolt corresponding to that chosen number is missing! This looks astounding!!!!! The plate can be shown from behind to prove there is nothing strange - it is normal in every way.